He writes: “Per-person incomes in Turkey and Chile are where the United States was in 1960. Malaysia is nearly there, as is Gabon.” This chart, which shows income distribution in 1960 versus 2012 shows the same thing. In 1960, people were lumped into two income categories, one mostly in the developing world and one–earning more–in the developed. Now income is distributed much more evenly. Because poor countries are not doomed to stay poor, how do we help them improve? Gates says it’s with more aid. The common argument is that foreign aid does nothing to help developing countries or dooms them to a life of dependency. Gates is particularly unimpressed by this line of reasoning. I added up all the money spent by donors on health-related aid since 1980. 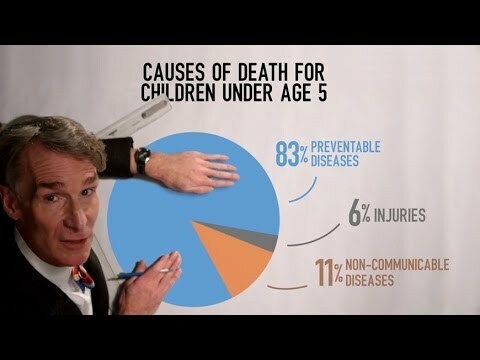 Then I divided by the number of children’s deaths that have been prevented in that same time. It comes to less than $5,000 per child saved (and that doesn’t include the improvements in health that go beyond saving the lives of young children). $5,000 may sound expensive, but keep in mind that U.S. government agencies typically value the life of an American at several million dollars. And what about the idea that aid breeds dependency? Gates lists countries that used to receive aid and now get none (many are now net donors, in fact): Botswana, Morocco, Brazil, Mexico, Chile, Costa Rica, Peru, Thailand, Mauritius, Singapore, and Malaysia. And if you’re against aid, can you say you’re against saving dying kids? What about all those saved kids? Won’t they cause the planet to run out of resources even faster? It’s an argument that appeals to even more progressive proponents of aid, but Melinda, who writes this section, says it’s simply not true. As child mortality decreases, birth rates go down. Mothers in Mozambique are 80 times more likely to lose a child than mothers in Portugal, the country that ruled Mozambique until 1975. This appalling aggregate statistic represents a grim reality that individual Mozambican women must confront; they can never be confident their children will live. I’ve spoken to mothers who gave birth to many babies and lost most of them. They tell me all their mourning was worth it, so they could end up with the number of surviving children they wanted. The letter, the Gateses hope, will serve to help people dispel these myths when they hear them. But even more so, to understand that giving money to organizations working on global health provides an incredible return for the global economy.